The Internet of Everything ( IoE ), also called Internet of Things ( IoT ) or Machine to Machine ( M2M ), the concept of technology having the capability to harness the power of the internet to communicate between devices. Now this concept may seem like a long shot but let’s go over some history before we can truly grasp this new Internet of Everything movement. To get a good understanding of how our world plays out, at least in the technology industry, we need a little bit of understanding about the technology adoption lifecycle ( picture from article below ). We see that this bell curve represents the adoption rate and who those people are. We start off on the left, we have a group called the Innovators, these are the people who are either building or are willing to take on new technology and test run it. After a while of the innovators supporting the new product, in comes the early adopters. These are the people that are not the “bleeding edge” but still wanting to explore. 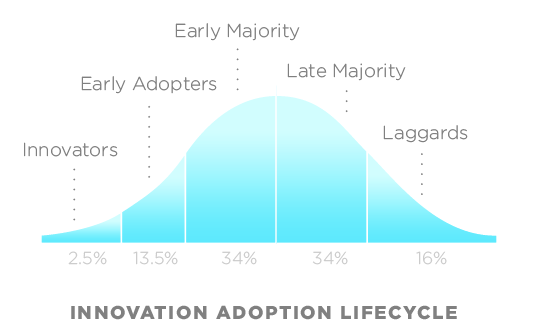 We now are at an interesting part in the adoption lifecycle, we are now at a point where some people call the chasm. This is a period of time where the majority of the public warms up to the idea of the technology. Not much happens during this time and this is where technology can be made or break. If the product crosses this “chasm” and becomes accepted, people start to adopt the product. we continue into the early majority. This is where technology gets exciting, after the steep increase in popularity happens, it becomes a norm and people are given crap if they do not have that certain piece of technology. This is where we have the late majority. Not pointing fingers but this is usually in the older community ( less accepting of change ) and I don’t blame them. The way in which the world is changing especially since it has been about 20 years from the first computer to where we are today. It probably seems like modern day terminator to them. Moving forward we have our late majority and we continue onto the late cycle of people called the laggards. This is the people who are still using AOL or have an original mac computer because it “still works fine”. Now that we get this concept of the innovation adoption lifecycle, lets continue onto what this article is really about. The idea of the Internet of Everything and why it should matter to you! Believe it or not there use to be a time in which people had to use pen and paper or a typewriter to write things down. In 1995 we had our “Fixed” (you go to the device) computing revolution, people lost their minds. The computer became a piece of technology capable of performing complex or meticulous tasks. This marked the start of something great, and in 2000 the market value of computers according to Cisco (page 13 ) was $200 Million. Entrepreneurs instantly see a market opportunity to capitalize on, Since we have computers why not create a smaller, faster, mobile device. If you haven’t guessed it we’re talking about the mobile phone. Between the years 2000 and 2013 this industry exploded to $10 Billion! We all seem to have a phone nowadays, you can get an expensive iPhone or a cheap pay as you go phone from the gas station. Something that people in 1995 could probably not even dream of, the rate at which technology advances is remarkable and exponential. This brings us to the year 2013 ( cuts it kind of close huh? We are on the cusp of a new revolution ). What is next you ask!? Today we now have small devices that can fit in our pockets and we can communicate on it using the internet. We are starting to see devices smaller and smaller get connected to the internet, we see google glass, smart appliances ( coffee machines, air conditioners ) and other wearable devices. Most products are trying to be “smart” in some way shape or form, We now move into the movement of Internet of things. This concept is that all of the things should be connected, able to communicate and be smart, report information back to the cloud and it stores that data. This is something we could have not had in 1995 when devices were large and expensive. Lets fast forward a bit and again according to Cisco (page 13 ) in the year 2020 we will see the market potential of internet connected devices rise to $50 Billion! That is a whole lot of potential in this industry. Products that once use to be cutting edge are now being replaced by cheaper, better alternatives that are internet connected. We get to a point in which the cost of producing the product the old school way is actually more expensive than creating it being internet enabled. This process will slowly convert our everyday devices into internet enabled ones. Imagine a world with a connected toothbrush, why you ask!? because they can. Now we have to talk about the future because we are not yet there, imagine a world in which all of these “things” can connect to the internet and talk to the “cloud”. 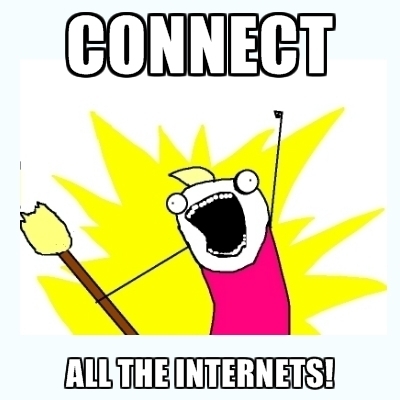 We now have the concept of Internet of Everything! This is the concept of how we can connect your car’s tire pressure gauges to a car which alerts you when you pass a gas station if your tires need to be filled with air? How about a world in which your toothbrush is connected to your home and the better your brush the more your house will automatically order candy for you!? Why!? Because they can… That is the potential of the Internet of Everything. Think about how many devices there are in the world… Gartner says there will be 26 billion connected devices in 2020, Think about why google bought nest for $3.2 Billion and why apple is releasing its HomeKit Platform. A revolution is coming and in my opinion it is going to be the largest market opportunity known to man, there is no way to predict what is about to happen, all that I know is it is going to be life changing. below are a few resources to take a peek at!